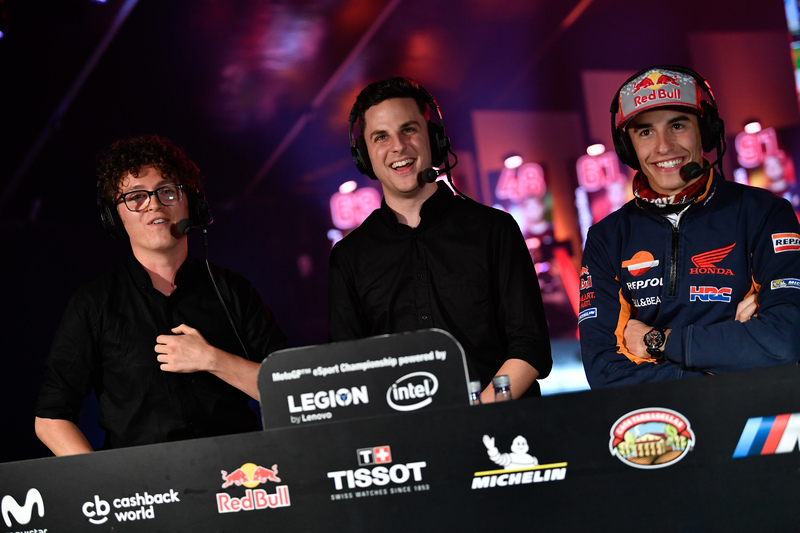 Ahead of the MotoGP esports finals in Valencia earlier this month, Esports News UK's Craig Robinson had a chat with Tom Brooks and Amy Dargan who co-hosted and casted the event and have experience reporting physical races. Esports News UK: What is your background on commentating, casting and hosting in esports and how did you come to work this event? Amy: I’m actually one of MotoGP’s presenters and pitlane reporters. When MotoGP esports was introduced last year with the inaugural championship, it was just a natural fit. With our background in MotoGP this is how we found ourselves at the first Esport Championship. Luckily enough, we didn’t mess up the first time, so we have been asked back for the second year! Tom: For myself, I started out in local radio and then looked into commentating over sim racing/esports - that's how I got into that whole field. I started doing some stuff for esports championships on television, like Realish Racing for Motors TV in 2015 and I commented for Gran Turismo in 2016. I joined Dorna (the rights holder for Moto GP) in 2017 as a commentator on the Repsol (Junior Bike Racing League) and worked on MotoGP. Then in that year, the opportunity came along to get involved with the esports project here as well. Last year I did the commentary but this year I'm doing a bit of hosting and commentary. "Who knows where MotoGP esports will go? The trajectory at the moment is definitely going to be on the up." How did you both find last year’s event? Amy: It was so exciting! Well, I have to admit I haven’t had any contact before with esports. So, this was really my first taste and I just couldn’t believe how realistic the action was and how dramatic things could possibly get out there. We had rehearsals last night which means our players have the opportunity to find themselves on the stage, we go through the whole qualifying and race procedures. We are definitely in for another treat tonight; the action is fierce and frantic. Tom: Yeah, I think it is incredible. The investment Dorna has made into the Esport Championship, and with esports growing in general, it’s nearly a billion-dollar industry and we have seen that steadily increase over the last few years. The fact that Dorna is getting involved and putting that investment in is just fantastic. We had that here last year at the grand final which was a really good way to start it. With the greater investment this year, we have had more challenges, people getting involved and live events. It has just been amazing. As Amy said, we had the rehearsals last night and the atmosphere was incredible. It’s nice to see people are enjoying it from home and here. So, it’s a really good thing to be involved with. What is it that you think has changed since last year’s event – have production values changed, is there more interest in the game? Amy: Well the game has been made available on more platforms. Last year, it was just available on PlayStation. But this year we have qualifiers on Xbox and PC as well. It has definitely allowed more people to take part in the qualifiers and challenges and you can see that in the finalists we have got here tonight. Tom: I have to echo this sentiment. More people being involved in more challenges means more chances to qualify. We have had players from Indonesia take part in the event which is great we have that market opened up. There were more British players, Spanish, Italian, German... You know, there’s a lot more nationalities now being represented in various stages. And that’s the unique thing about esports, anyone can get involved with it. You can sit at home if you have a gaming platform of some description and it’s so available whether you’re 62 and it's your hobby or 14 and it’s your hobby. There are no limitations in that retrospect and It’s one of the things that makes esports so great. Amy: Even the way the championship was constructed this year, the format was slightly different. We had two live and on-site semi-final events, eight different challenges. There was already such drama way back when we had the first semi-final starting in Misano, Italy. Obviously, we have our reigning world champ here tonight, but he was actually in the first semi-final and he didn’t get through, which was a very big shock. He managed to qualify through the second semi-final instead. Last night in rehearsals, we saw there is a very big potential for another shock upset, even if he is one of the favourites to win tonight. Tom: I think we saw last night that all the riders were separated by something as close as half a second from each other in terms of lap time. But in racing terms, that is extremely close. "Many riders said they actually used the video game in order to learn the track. They use the game in order to be more competitive out on the track come race day." There are six Spaniards, five Italians and one German that have qualified for the esports finals. One told me he thinks the players are more inspired by their national heroes in the actual MotoGP. Do you reckon this is true? Amy: I think that is something more individual with this Esport Championship compared to other games. What you quite often find here is that rather than the players being just gamers, they are fans of the sport. So, what you probably have is they are a fan of the sport and then they buy the game. And I think that’s why we have the representation from those countries. Tom: In terms of cultures and different countries like Spain and Italy, bike racing is incredibly popular. You look around cities like Valencia and you see the flags hanging from cafes in the city centres and such. It’s so popular and I think that is a reason why people from Spain and Italy are so heavily invested in it. They want to be the equivalent of Lorenzo, Rossi, Marquez, etc. That’s who they have seen growing up and they want to support their home nations. The excitement from the competitors here is fantastic as you can tell the amount of time they have put into it. And it’s great to see them rewarded for it. There’s a huge transition from sports to esports going on with the likes of FIFA getting its own ePremier League. Even here you have players competing in their own venue only 100 metres away from where their idols are physically racing tomorrow afternoon. Do you have any comments to encourage people to get involved in these sorts of events? Amy: Play the game, honestly. We speak to the riders all the time when we go circuits (as Dorna). For instance, we went to Buriram in Thailand this year. Many riders said they actually used the video game in order to learn the track. Our Moto 2 and 3 riders certainly did as they never had access to test there. So, they used the game in order to be more competitive out on the track come race day. Now there are more challenges in the esports qualifiers, there are loads of opportunities to compete virtually at home. It’s not just this one loss and you’re out, you have several opportunities to qualify. Tom: Yeah I agree. It is as simple as that: have that game at home and go racing. As Amy said we have seen the MotoGP riders, Jack Miller (Australian MotoGP 3 racer) in particular said he meets up with the Espargo brothers and Vinales (Spanish MotoGP 3 racers) online to play together as a fun thing. But there is competition and they learn the track; these riders live and breathe MotoGP. And it’s the same on the esports side of things. These players on stage want to be a part of something that they love and is fun, which is exactly what MotoGP and its esports is. "All the riders in one match were separated by something as close as half a second from each other in terms of lap time." In a few years’ time, where do you think MotoGP could be? Tom: It is difficult to say really. I think you must look at esports in general to see how everything progresses. You know, look at the last two or three years in esports and how it has made that big step into the mainstream market. And if it continues growing in that way, which there is no reason to suggest why it shouldn’t, then the possibilities are endless. If we look here, we have sponsorship advertisement with Movistar, Red Bull, Tesso etc. All of these backers getting involved with the Esport Championship realise it is great exposure for their brand to get their product out there. And that is exactly what esports is. Esports is that platform players want to be a part of. Who knows where MotoGP esports will go? The trajectory at the moment is definitely going to be on the up in two or three seasons if we get something even greater than what we have already. We’ll have a great time in the next three to five years I’d say. Amy: Exactly what Tom said. Even from a television point of view, tonight’s final and last year’s final is covered by all the main broadcasters and partners that cover the MotoGP Championship. This speaks for itself with how recognised esports is now, especially in the last couple of years. I think that MotoGP has joined in at the perfect time really. Thanks to Milestone Interactive and Dorna for covering Esports News UK's trip to Valencia for this interview. Check back for more content on the event soon.